Upon arrival at Denpasar International Airport, you will be welcomed by your attentive driver at the arrival gate with a sign board with your name on it. You will then be transported to your hotel or private residence in Ubud (approximately 1 hour away) in a private air-conditioned minivan accommodating up to 5 people with luggage. Receive great first impressions when you arrive in Bali. Your driver will provide a warm, friendly welcome before escorting you safely to your accommodation. Your driver will be standing at the front making your driver easy to find. They will help you to skip through the crowds at the airport and out to your waiting, private air-conditioned minivan. You will then be transported to your hotel or private residence in Ubud (approximately 1 hour away). Your private air-conditioned minivan accommodates up to 5 people with luggage. 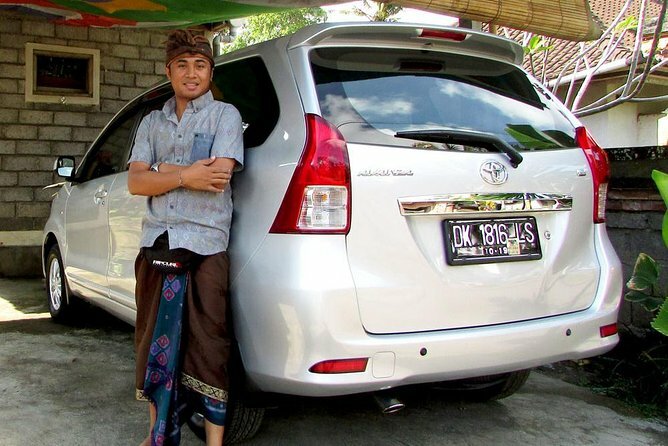 Your friendly driver will be happy to answer any questions you may have about Bali on your journey. Price is per person based on 2 to 5 people per vehicle. To meet your flight arrival time. Our driver Made was fantastic. Super funny and made the 2hr drive fun. Even let us stop at a supermarket to get supplies. 10/10! Our driver MADE (pronounce mah-day) was fantastic. He was waiting for my family and I with a sign with my first and last name on it. He helped with our luggage and had complimentary water bottles waiting for us in the car. He was friendly and very knowledgeable about Bali. I highly recommend him.